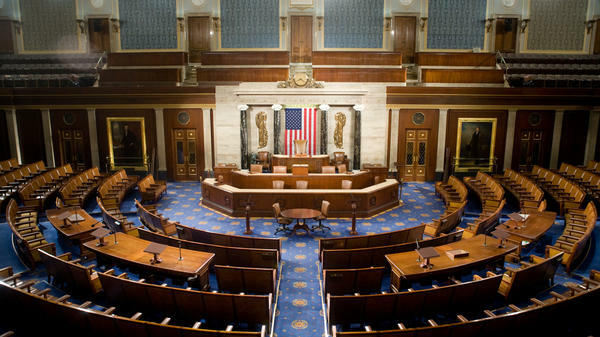 The U.S. House of Representatives chamber, where a new omnibus bill around music regulations was introduced on April 10, 2018. Last year, from spring to summer, two organizations — the Nashville Songwriters Association International (NSAI) and the National Music Publishers Association (NMPA) — made their case to the Copyright Royalty Board that Spotify, Apple, Google, Amazon and Pandora weren't paying songwriters enough when people streamed their compositions, a process that NMPA head David Israelite likened to "war." Those compositions, which are legally discrete from the recordings of those songs, are covered by "mechanical" licenses, a term that's roughly 100 years old and originally referred to the punch-card copies of songs that player pianos would use to keep sarsaparilla joints bopping, but now simply means any reproduction of a composition, including hearing it through a streaming service. The giant knot that is music licensing in the U.S. is particularly spaghetti-like when it comes to these mechanicals, which have also been front-and-center in the tug-of-war between tech and the established music industry since people first began thumbing up and down on Internet radio stations. But now, a year later, songwriters and streaming platforms are sitting on the same side of the table, professing support for a new piece of legislation that will update several byzantine areas of how music is treated legally — foremost among them, the way songwriters are paid in the new era of streaming. "Politics makes for strange bedfellows," Chris Harrison, CEO of the Digital Media Association — a trade association that represents big tech's interests in the content wars — tells NPR. The "music omnibus" bill, introduced Tuesday from a bipartisan group including outgoing House Judiciary Committee chairman Bob Goodlatte (R-Va.) and Jerry Nadler (D-NY) and approved unanimously by the House Judiciary Committee today, is the first significant piece of legislation around music in about two decades that has a prayer of being passed. At its core is a recognition of the nearly inextricable relationship that the music industry now has with streaming companies. "Because of inadequacies and loopholes in the law, there has been litigation in federal and state courts on a variety of fronts with mixed results," wrote Rep. Nadler in a statement. "This has put music creators' rights at risk, and created uncertainty for digital streaming services." As NPR has previously reported, the bill will establish a public database of compositions, who owns those compositions, who wrote them and who administers them. This will be accomplished by establishing a new non-governmental organization called the Music Licensing Collective (but is rumored to eventually be named SongExchange, a sister to the similarly situated SoundExchange) to run that database, with a board made up of representatives from the major publishing companies and songwriters themselves. The deal brokered between tech and the music industry is that tech companies will assent to much-needed statutory changes (discussed below) and foot the bill for the creation and administration of that new database; in exchange, those companies would receive a "blanket license" that would shield them from, say, being hit with several billion-dollar lawsuits over failing to secure the rights to those compositions in the first place. "Having billion-dollar lawsuits is not productive, ultimately," says Richard Burgess, CEO of the American Association of Independent Music (A2IM), a trade group that represents indie labels in the U.S. "What's really impressive about this particular endeavor is that everybody's been prepared to compromise and to set aside the smaller differences in order to recognize the fact that there's a bigger win here for everybody." "This is something that Congress asked of us," writes Daryl Friedman, an industry and government relations officer for the Recording Academy, the parent organization of the Grammy Awards that is heavily involved in music advocacy on the Hill. "There had been a few different music bills introduced throughout the past few years, segmented out for various creators. They wanted us to come together and with consensus, present the key issues that the whole music community could get behind." AMP: To give a statutory framework for assigning royalties to producers and engineers. CLASSICS: To spackle over a loophole that allowed digital broadcasters like Sirius XM to not pay royalties when they played songs recorded prior to 1972. Songwriter Equity Act: Allows for the Copyright Royalty Board judges to consider market conditions (what's called "willing buyer, willing seller") when setting its rates. Also, a "wheel" mechanism will be introduced to the court proceedings of ASCAP and BMI that will free them from arguing their cases in front of the same judge(s). The substance of CLASSICS and the Equity act amount to concessions from the tech industry, which had a vested interest in them not passing because they would, eventually, lead to higher licensing costs. But the bigger win for those companies is fewer roadblocks in front of streaming's growing popularity (nevermind that the model's highest-profile companies have yet to turn a profit). "We've had two, consecutive, double-digit years of growth in our industry, and we expect that to continue," Burgess says. "We wouldn't have gotten to this point but for the fact that both sides were willing to come to the table and willing to negotiate," says DiMA's Harrison, whose organization represents the interests of companies whose are squarely at odds with those of songwriters — his clients want to pay less, songwriters want to make more. "I do think it's the success of streaming and everybody's recognition that this is the way people are going to consume music going forward. If we have a system that is broken, that's going to curtail investment and it's going to slow consumer adoption, it means, at the end of the day, everybody makes less." "There's just no chance that either side would be able to run over the other side in the legislative process," says David Israelite, president and CEO of the NMPA. "I approached the other side with that message, that look, if we can come to an agreement we can pass something, if not we can both dig in and fight with each other." "It's not that everybody is one-hundred-percent in love with every provision of it," says A2IM's Burgess. "There are definitely things that people have concerns about." Some of these concerns include a "black box" distribution, which means that if Spotify, or any other streaming company, can't find the songwriters its supposed to pay, they hold that money in an "interest-bearing account" for three years. After that, this black box of money is distributed to publishers based on their market share, raising the possibility of major companies being given money put aside for those whose names are least well-known. Another is the representation of the Music Licensing Collective's board — 10 of its voting members will be representatives from publishing companies while four will be songwriters. Since the turn of the new century, tech companies and the music industry have been in something of a lopsided dance-off. As the music industry jitterbugged along in the late '90s, controlling the means by which people could hear music (as it always had), a new generation arrived and shattered that control to pieces, like a daisy in a mosh pit. The music industry responded to this digital generation with trepidation, and sought through the intervening years to hold steady to the reins of peoples' listening as their revenues cratered. Daniel Ek, the co-founder and now-billionaire CEO of Spotify, even had to steal their music and present it to them to prove to them his little Swedish startup could work. Now that it, and the business model it popularized, have overcome doubts and scandals and myriad lawsuits, all that's left is to figure out the future. And, at least for the time being, they have to do it together.